Leading outdoor lifestyle brand Timberland has announced “Canvas that Cares,” a new program created to raise funds for non-profit organizations through the auction of custom-designed, limited edition Earthkeepers footwear – Timberland’s most eco-minded collection. 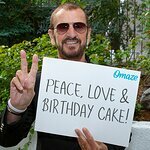 Rock and roll icon and artist Ringo Starr is helping to drum up support for the initiative by lending his original peace sign artwork to the inaugural boot collection. Proceeds from the auction, which kicks off December 1 on eBay, will benefit WaterAid, a non-profit dedicated to improving access to safe water, sanitation and hygiene in the world’s poorest communities. Starr’s original design will appear on 75 pairs of the Timberland® Earthkeepers City 6" Leather and Fabric Side Zip boot, each of which he signed personally. This marks the first time in more than three years that Starr has autographed any memorabilia. A colorful peace sign on a canvas panel is symbolic of the artist’s personal mantra of peace and love; three stars embroidered along the back of the boot are a nod to his name. The limited edition, autographed boots will be available on eBay beginning December 1, accessible via Timberland’s Canvas that Cares hub. Bidding opens at 9pm EST on December 1, and closes at 9pm EST on December 11. To ensure distinction among the 75 pairs of boots being auctioned, each pair will come with two sets of laces, in assorted colors and styles. In addition, 35 pairs will come with a Timberland Whiteledge Recycled Nylon Packable Duffel Bag (in assorted colors); and 10 pairs will come with a second pair of Earthkeepers City 6" Leather and Fabric Side Zip Boots, in a range of sizes. All 75 pairs of signed boots will be size 8 – Ringo’s shoe size. The collaboration aims to raise a minimum of $18,750 for WaterAid, with the starting bid for each boot package set at $250. The boots are being listed using eBay Giving Works, the company’s innovative online philanthropy program which enables millions of people to easily connect with and donate to organizations they care about. The auction is being managed by Auction Cause, on behalf of Timberland. To further support the initiative, Starr’s “All-Starr Band” will wear the limited edition boots on upcoming tour dates. Consumers can learn more about the program, auction, WaterAid and the collaboration at www.timberland.com/canvasthatcares.